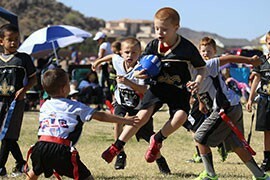 Youth participation in flag football, basketball and soccer is on the rise in Mesa and elsewhere. Coincidence? Or is increased awareness of concussions in football the primary cause? A 2014 study by Neurology.org showed that former NFL players who were exposed to tackle football before the age of 12 had greater cognitive impairment at a later age than those who were exposed after the age of 12. Not surprisingly, parents are searching for alternatives, like flag football. James Smith, a program director in Arizona for youth sports organization i9 Sports, said he has seen his flag football program grow in recent years. Numbers aren’t just going up in flag football. In Mesa, recreational programmer for the city Lacy Bienkowski has seen enrollment numbers go up in a number of her programs. Bienkowski and Smith both hear concerns from parents over tackle football, leading some to remove their children from the sport. “I do get parents who tell me, ‘Hey, I want my kid to play basketball, I don’t even want to do flag, I don’t want him to like football,’” Smith said. Smith, however, doesn’t play off fear to promote his league. Both program directors agree awareness and education are the keys to the future. The city of Mesa created the Positive Play Project, an educational resource Bienkowski believes has helped the city stay on top of the concussion issue. “We took a huge step, back in the fall of 2013, we started the Positive Play Project, which is all about wellness and development in youth sports. All of our coaches go through this training once a year, and they get training from A.T. Still University on concussions,” Bienkowski said. There are still no guarantees young players are safe from all injury risks, even in flag football. “It gets them out of the house,’’ Smith said. “It’s a great sport as far as physical activity. I even tell parents, ‘Your kid may run into another kid.’ They’re 8, 9, they are clumsy kids. As concussions continue to make headlines, the number of kids playing organized football has dropped in recent years. Parents have a big say when it comes to the sports their kids are playing. While some have encouraged their children to avoid football altogether and look to alternative sports, other parents are not focusing on the potential injury risks and letting their children take to the gridiron. A member of the Kinght Saints jumps in the air as he tries to elude members of the Scruggs Raiders after making an interception. Concussions in tackle football have led to more and more parents signing their kids up for flag football leagues, such as PrimeTime Athletics, which oversees teams such as the Raiders and Saints.